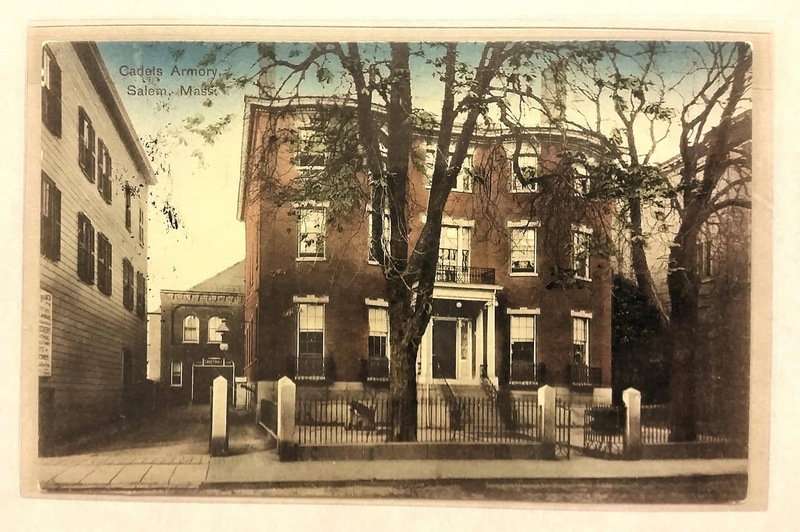 In 1890, the Second Corps of Cadets purchased the Francis Peabody House at 136 Essex Street to convert to the Salem Armory’s head house and used the land behind the home to construct a drill shed. The Francis Peabody House was a Federal style mansion but featured an addition with an extensive Gothic-style banquet hall built for the Peabodys. The hall contained tall fireplaces with carved medieval lions and leopards and was also adorned with large antler chandeliers. The Second Corps of Cadets razed the main portion of the Peabody house in 1908 in order to build a new, larger head house. 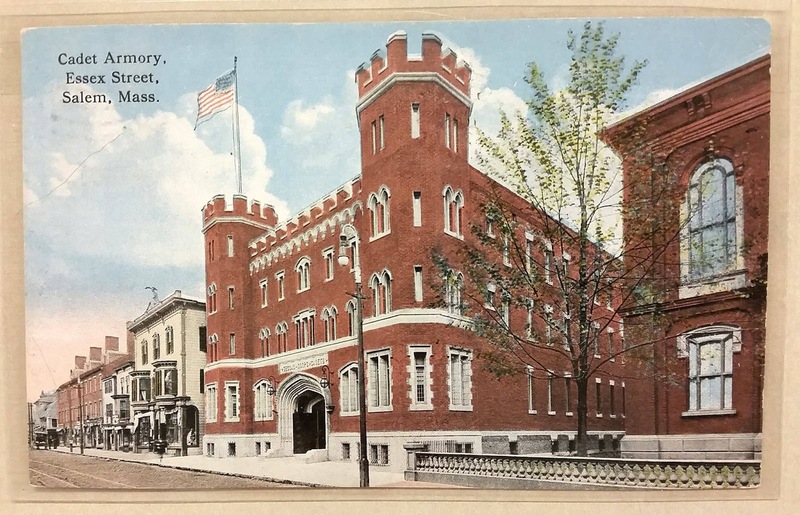 The new Armory incorporated the original drill shed from 1890 and Francis Peabody’s ornate banquet hall. The new castle-like building was designed by John C. Spofford and was also styled in the popular Gothic design of the time. 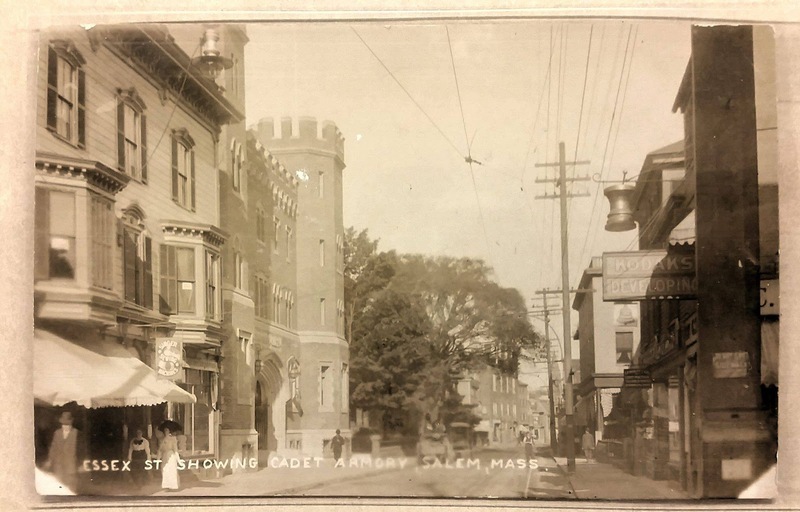 In addition to housing the Second Corps of Cadets, the Armory was used for a variety of civic purposes including celebrations, fairs, dances and performances by Salem’s Cadet Band. On November 1, 1933, during his first presidential campaign, Franklin D. Roosevelt greeted a crowd of over 5,000 at the Armory. 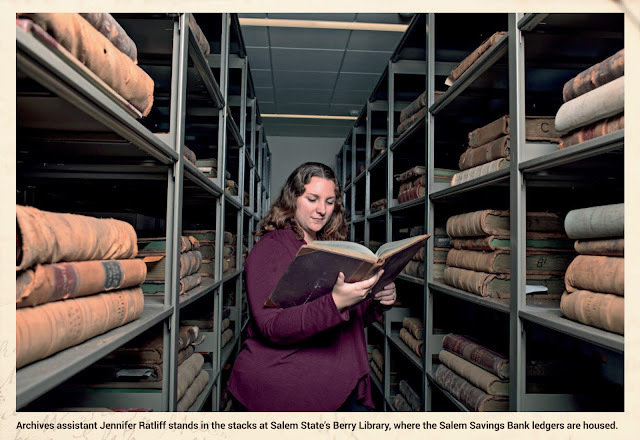 He was quoted by The Salem News as telling the attendees that he was very excited to be back in Salem, a city he had visited many times while attending Harvard in nearby Boston. In February 1982 the head house of the Salem Armory was destroyed in a series of arson attacks that ravaged the city. 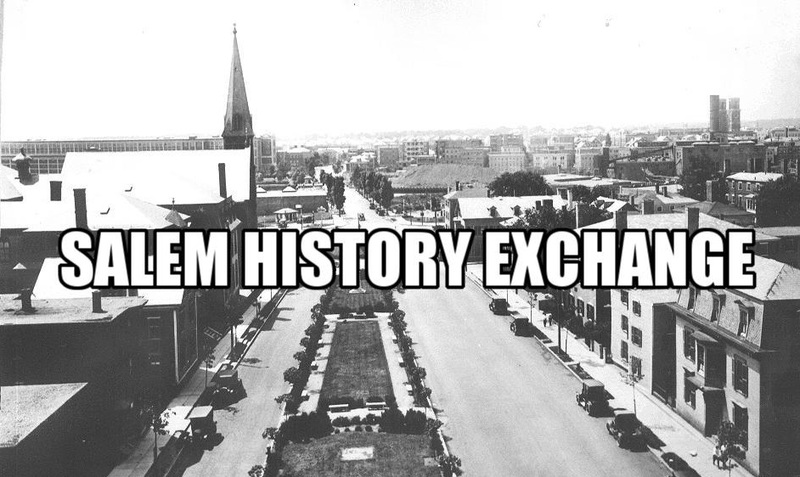 That time would be referred to by local police and firefighters as “a reign of terror.” More than 30 communities sent firefighters to aid in battling the inferno at the Armory, as well as fires set at the Power Block and Masonic Building, both on nearby Washington Street. Unfortunately, many of the Second Corps of Cadets’ records and artifacts were lost in the fire. The surviving drill shed, located in back of the property, was converted into Salem’s Visitor Center by the National Park Service in 1994. The facade of the Salem Armory remaining after the fire, stood until 2000, when the lot was purchased by the Peabody Essex Museum. Despite multiple proposals for the buildings reuse, it was ultimately demolished. The location where the head house once stood was transformed into Armory Park to commemorate the military members of Essex County. I saw Mitch Ryder and the Detroit Wheels play at the Salem Armory. I don't remember the year (late 1960's?) but remember the snow storm that night. I'm jealous that you were able to go inside the building while it was still standing! It was used for indoor track meets in the late '50s and early 60s. I remember it well wit the banked plywood corners. I was in the National Guard there in the 60's Was a big building.